I loved the version of Sinkin, especially the eyes and cheek. I think it's missing the detail of swirl on cheek yet. The darkening of the colors on the sides gave a good sense of depth. I also believe that the shadows of the bubbles could be all pink as the three bubbles at the top of the head. Malefor could have also edited the tentacles with thorns which I referred. 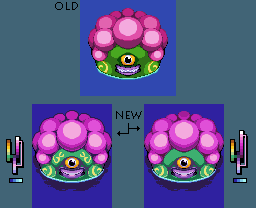 Sinkin, I love the new version, but as leduardo said, it still needs the swirls on the cheeks, maybe I can fuse the swirls on the cheeks into your sprite later and see how it looks like. EDIT: the tentacles i did in the original sprite where made form the video, i print screened it for like 15 frames when the tentacles moved and then overcoated the tentacle with MC colours. Thats how I got that smooth movement on it, but the shading on it doesn't look right to me. Does anyone agree? This is the final edit from me, fixed the blobs and the swirls. I hope you get the point of my edits, Malefor. I like the phytops sprite! Looks creepy in the water. Thank very much for the deku link sprite with the pipes Malefor!! I loved it, what do you think of the tentacles, can you fix something of them? Uh, did some changes to it, and ended up with two different versions. Also; improved palette, and changed some colors to my likings. I nearly cried when i saw that, THANK YOU A LOT!! could you also try and do the blobs on top of the eyes and them braking? Good palette, but I think it got a bit too messy around the eye with two different colors, the mouth was also a bit hard to read. Just fixed some minor things on it! thank you all for all your help, I will post the new version with the new tentacles I tried soon. Credit will be given to all of you. However, I only did this for fun, while bored. I went to the forest and found this guy, he was wearing a black suit with a red tie. he was pale as plain paper and he had no face! The tentacles could probably use some more detail to match the body, but other then that the sprite looks good to me, although sticking true to slenderman his body isnt proportained right, as in very long legs and such. but the detail and how the sprite looks is very good! Blaze has a good point: Slenderman is pretty tall. Equally, his arms are really, really long and not proportional. The tentacles look strange. The body also looks differentish in each tentacle shot. I know, I´ll make him taller, after the slenderman, I´ll post my attempt of the Minecraft Enderman in MC style. Like I said above, I´ll make him taller, plus I´ll make the tentacles more MCish. Anything else? what about the transporting sprite? is it OK? While I was working on the Slenderman sprite I got the idea of making the sprite of Moldarach, so I did. It turned out pretty good. Give me your opinion. Page created in 0.17 seconds with 61 queries.